Colleges, universities, and schools across the U.S. are sharing millions of dollars of nanotechnology instrumentation for training future high-tech workers using streaming media. The National Science Foundation estimates that 6 million nanotechnology workers will be needed worldwide by 2020. Two million of those workers will be needed in the United States alone. The Remotely Accessible Instruments for Nanotechnology (RAIN) network is on the leading edge of providing a proven method for disseminating the education necessary to train students in the toolsets and technologies needed for continued growth of the U.S. nanotechnology sector. For engineers and scientists, nanotechnology is likely a familiar term. For the layperson, it can be a bit confusing. The nanometer is a unit of length in the metric system, equal to one billionth of a meter (0.000000001 m). In a nutshell, nanotechnology deals with the fabrication, analysis, and production of very small structures in electronics, biotechnology, medicine, and untold consumer goods. Nanotechnology is impacting nearly every market sector. For example, Intel’s 7th Generation Intel Core i7 microprocessors have a feature size of 14 nanometers built on the semiconductor. The capability to create useful features at this size scale permits the 1.5 billion transistors to be fabricated on a silicon substrate. Without applied nanotechnology there would be no smartphones, no laptops or tablets, and certainly no mobile streaming capability available in the handheld devices we all use today. As important as nanotechnology is to the electronics sector, it may be even more life-changing in the areas of medicine and common consumer goods. Nanotechnology is the common denominator in solar panels, new medicines for the treatment and possible cure of cancer, cosmetics, clothes that never need cleaning, and the protective coatings on both your eyeglasses and the wheels of your new car. The National Nanotechnology Initiative (NNI) began in 2000 as a U.S. government research and development initiative involving the nanotechnology-related activities of 20 federal departments and numerous independent partners. More information available at Nano.gov. The 2017 Federal Budget has allocated more than $1.4 billion for the National Nanotechnology Initiative (NNI) programs. The total NNI investment since fiscal year 2001, including the 2017 request, now approaches nearly $24 billion. Nanotechnology represents applications that will cause a revolution in industries and technologies on a worldwide scale that will change the way we live on our planet. It is often stated that countries that do not embrace nanotechnology may be the unfortunate victims of a future failed economy. RAIN is preparing our future workers for great jobs in a growing market segment. The RAIN network began at the Pennsylvania State University and is currently led by nanotechnology evangelist Robert Ehrmann. He has been instrumental in providing the leadership for the initial project and the continued growth the network is experiencing. Assisted by nanotechnology professors and graduate students at the university many of their tools are remotely accessible from educational institutions around the world. Dr. Ozgur Cakmak leads the day-to-day operation and connections at Penn State and has even conducted a remote session with his high school alma mater in Turkey. 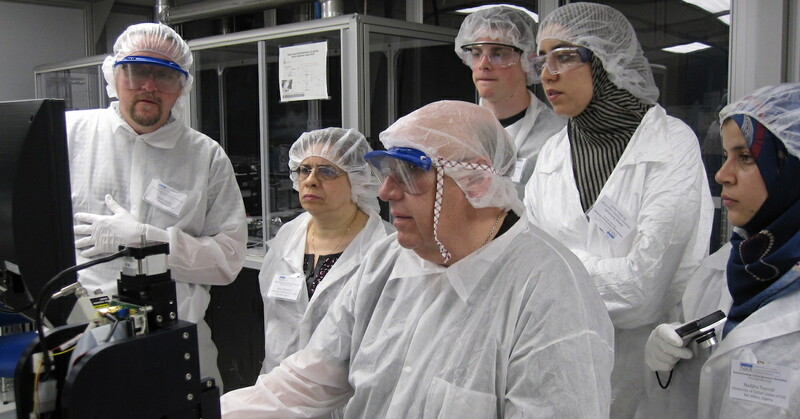 My first experience with the RAIN network was as an attendee at the “Hands-on Introduction to Nanotechnology Workshop” presented by the Center for Nanotechnology Education and Utilization (CNEU) at Penn State University. There I saw a scanning electron microscope (SEM), an atomic force microscope (AFM), and other tools that were networked and controllable by students at remote sites using readily available remote sharing and streaming software. I subsequently became a member of the newly created Nanotechnology department at Erie Community College. Our first remotely accessible instrument was also a scanning electron microscope operated by our technician Rich Hill. He regularly conducts remote sessions with students and teachers across several states. With an internet connection and a small software installation, students at remote sites can take control of our SEM to view biological samples, semiconductor circuits, and perform elemental analysis of samples at thousands of times magnification. The students have full two-way voice communication and are guided through the session by our technician. These sessions provide a tremendous opportunity to engage students with technology that their schools could likely not afford nor have the expertise to operate themselves. We provide a unique opportunity to engage students and show them the possibilities of nanotechnology careers. Currently there are 10 sites in the RAIN network, with more sites in the continental United States coming online in the near future. Each of the partner sites has at least one remotely accessible instrument and over half have four to six instruments available for remote connections. Remote sessions are requested and scheduled via an online form and any of the partner sites can be requested from anywhere in the country. A test session is usually scheduled for first-time requests to assure the remote site has properly installed the videoconferencing software. Depending on the instrument and the partner site requested, the remote site will need to install either Team Viewer or Zoom. Both are free to download and use for the remote site. In-house samples can be used, or the remote site can send in samples they wish to view to the host site. Live sessions are then conductedl they can last from 15 minutes to 2 hours depending on the instruments used. Remote sites usually display the instrument video on video projectors for class use with two-way audio. The host site technician is always available to assist in the explanation of what the students are viewing and for changing samples for additional viewing. At the Micro and Nanotechnology Conference held at North Seattle College, the RAIN leadership team concurrently connected to six of the network host sites as a demonstration of the network capabilities and available instruments for conference attendees. Through 2016 more than 1,700 remote sessions were conducted by RAIN host sites to remote sites in most of the U.S. and Puerto Rico. Additionally, international sessions were conducted to Turkey, Pakistan, India, and Bangladesh. More than a quarter of the remote sites had 25 or more student participants. Two-year colleges accounted for 37% of the participants, followed by high schools with 30%, and four-year colleges at 17%. Moret han half of the remote sites are already teaching some type of nanotechnology curriculum but lack local access to the instrumentation. The most requested instrumentation were the electron-based microscopy tools and most of the responses indicated that the primary reason for conducting the remote session was to teach students the fundamental use of the equipment and learn more about the field of nanotechnology. Eighty-five percent of the remote site instructors stated that their students could not have had this type of experience without the RAIN network, and more than 97% stated that they would like to conduct additional remote access sessions. Erie Community College is just completing a new Center for Nanotechnology Studies in Williamsville, New York. The new facility will house a 1,600 square foot ISO 7 cleanroom for nanotechnology experiments, fabrication, and analysis of nano materials. In order to significantly increase our streaming capabilities, 12 high-definition PTZ cameras are mounted throughout the cleanroom for streaming laboratory demonstrations anywhere in the world. Network connections are available at every workstation to connect our instrumentation to the RAIN network for hosting remote sessions. We are currently hosting up to four remote sessions per week and we expect to greatly increase our connections in the near future. RAIN is growing into a large national and international network of educational institutions providing leading-edge nanotechnology education for the visionaries and entrepreneurs of the future. All of the RAIN network partners are eager to share our technology and bring more hosts and remote sites into the network. For more information and to schedule a remote session please contact the RAIN Network. At the website you will find introductory videos, information on the tools available, partner site information, a gallery of some of the nano-scale images, and a quarterly NANOWIRE newsletter.